The question of where we will be dumping our garbage will soon be high on the agenda of the town council, says Deputy Mayor Steve Brown. He says he will raise the issue once new councillors Jacinta Price and Jamie deBrenni are settled in. Cr Brown proposed two years ago that whilst the new transfer station should remain where it is, the actual landfill dumping site should be relocated away “from one of the most iconic entrances to a town anywhere in the nation”. 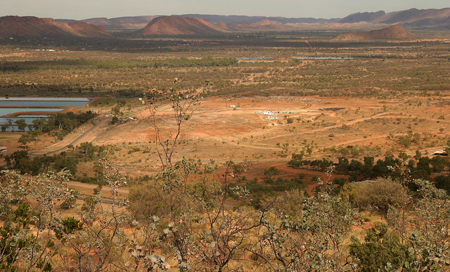 However, Mayor Damien Ryan favors extending the present landfill westward into the Desert Park national park, on the southern flank of the MacDonnell Range. “I’ll be working like hell that there is no further extension of dumping there. Our waste will have to go elsewhere,” says Cr Brown. He says the present site should be rehabilitated as part of plans to expand the Blatherskite Park sporting facilities. PHOTO: View into the Ilparpa Valley across the landfill (before the construction of the transfer station) and part the sewage ponds, from the eastern side of The Gap. I was recently in Mt Isa, if our dump looked like theirs, yes, move it. Our doesn’t though, ours looks awesome, you can expand Blatherskite Park and keep the landfill where it is. It’s not an eye-sore, it’s something to be proud of.